Stop Rottweiler Puppy Biting " "
Once you bring your Rottweiler puppy home, one of the most important lessons you need to teach your dog is not to bite. Even though it may appear to be a cute act when he nips at your fingers, toes or clothes while playing, it is teaching him an extremely bad habit that will not be so cute once he gets older and bites harder. If your Rottweiler puppy does anything as a pup that will be unacceptable when he is older, you must let him know while he is still a pup that this behavior will not be tolerated. It is much easier to prevent your dog form developing bad habits when he is a puppy than it is to train him out of it when he is an adult. If your puppy appears to be forming a biting habit, the following are two methods you can try to give him the message that biting you and others is wrong. MethodOne – Your Rottweiler puppy, like all puppies, will love to play with you whenever he can, and never looks forward to being alone. Therefore, as soon as your puppy begins to bite or nip at you or your clothing, say “OUCH!” in a voice that sounds like yelp, glare at your puppy directly in the eyes and walk away from him and ignore him. After a minute has passed, get a toy and go back to playing with your puppy. You should encourage your puppy to play with the toy. However, should he go to bite you again, repeat the same maneuver – yelp and walk away. Method Two – If the first method doesn’t have an affect on your Rottweiler puppy, you can try a more physical approach. When your dog bites, begin by yelping ouch as you did in the first method, but as you yelp, grab your puppy by the loose skin on the back of his neck and give him a firm (not aggressive) shake and say “No Bite!” in a firm tone. This should startle your puppy. Release him after you’ve given the command and turn his attention back to his toy. If this method seems to work, eventually you can remove the physical aspect from the training and just use the verbal command. It is in your best interest to try the first method before trying the second. The reason is because in some cases, the second method will have the opposite affect on your Rottweiler puppy. Instead of becoming startled and associating your action with discipline, your pup may associate it with aggression and continue to bite you. Dangling toys or treats above the dog’s head, encouraging him to jump up and snap at the item to get it. 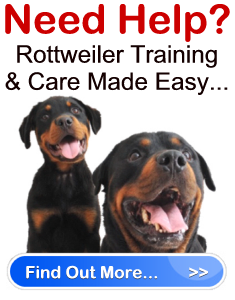 Finally, if you find that regardless of what method you use, your Rottweiler puppy is still biting, it’s a good idea to get in touch with a behaviorist, and have your dog analyzed by his Vet. There could very well be a reason why your dog is biting. Furthermore, make sure your children know never to tease or hurt your pup, and that your dog is well socialized and brought up in a trusting and loving environment. One bad experience is all it takes to give your dog the wrong idea and make him become aggressive or defensive.